« Check Out Creighton Volleyball! Hey Bluejays! My name is Ellie Mata, a junior nursing student. As an RA in Kenefick Hall this year, I have the extraordinary opportunity of being apart of Kenefick Hall’s new all-campus program: Keneflix 2012. Kenefick’s movie theater received a serious update in technology for this year. Students can watch the Huskers, play COD, have Wii tournaments, watch TV with friends, and more! This theater is the home of the new Keneflix 2012, a semester-long program that brings new movies to Creighton students before they are released on DVD. So far this year, Keneflix has shown Rock of Ages and The Amazing Spiderman. NEXT UP: Brave on October 3rd and 4th. 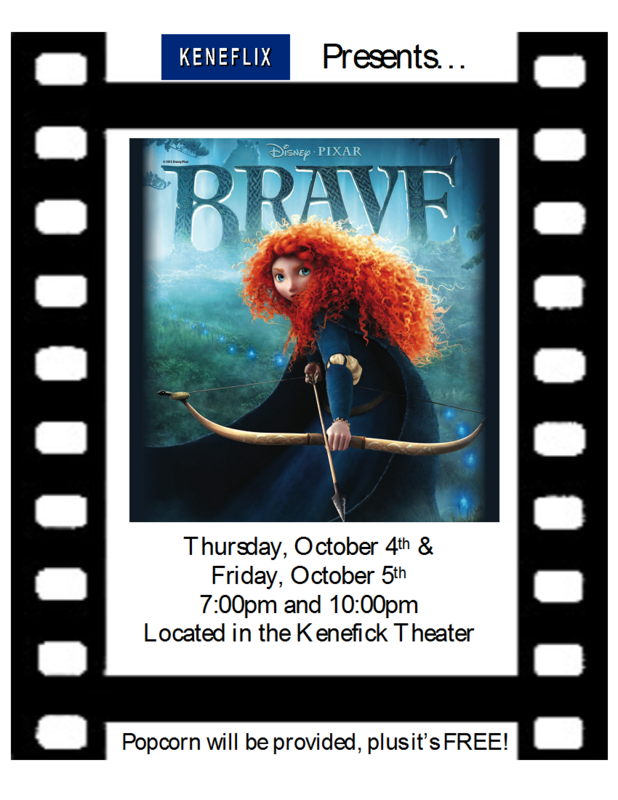 The showings of Brave this week will happen on 7 pm and 10 pm on Wednesday and Thursday, because of Fallpalooza on Friday. I can’t end this without telling you that there is FREE POPCORN at every showing, along with a variety of popcorn seasonings to give your snack something special. Join us in the Kenefick Theater for Keneflix 2012 where you can sit back, relax, and enjoy the show!